Want to look like a true Superhero this Halloween? 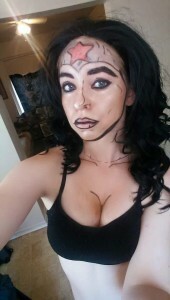 Why not try the comic book look! Stand out in a crowd with crazy jawlines and authentic comic features. Make your Halloween costume shine with these superhero makeup tips! Our brand ambassador, Audune Cuthalion from Iron Skies Cosplay walks us through her process on creating this marvelous comic girl look! Apply a very light foundation on your entire face and neck area. 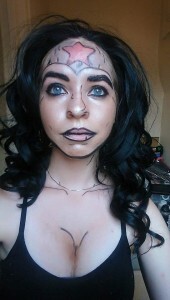 To get the dramatic comic book look, you are going to want to accent your features to appear as if you are a drawing, using black Halloween face paint/pencil, or liquid/potted eyeliner. Eyebrows – Make them appear more dramatic and dark. Nose – Draw a line down the center, as well as lines where your nostrils meet your face, and lightly around the inside of your nostrils to create a shadowed appearance. Jawline – Under the ear, down under the chin and up to the other ear. Outline of lips – Apply Red Lipstick. Line your lips with black. For an added pop, take a bit of white and put it on your lower lip to give a reflected look. Don’t forget your upper hairline and ears! When applying eyeshadow, make sure it’s a colour that pops, like bright blue or purple. The eyes need to be very dramatic, so make sure you extend the shadow up and over your eyelids until it’s just below the brow bone. Outline the shadow with the black, and draw in “fake” lower lashes extending only from the outer, lower corner of the lid. Apply mascara (and big, false lashes if possible! The more over-the-top, the better!). Next, you will be applying the “dots” onto your face to get the full comic book look. This is totally optional, but if you are going for just the comic style this looks great. You can do either white or red dots, but red dots look more authentic. Red pencil liner works best here, but if you have none you can also use lipstick or face paint. Try to make sure all the dots are the same size and even. Keeping the dots as even as possible will make or break your look. If the dots are uneven people might think you’re just someone with chicken pox! Instead of using spots you could also add shimmer to your skin to create a grainy look. To seal your make up apply baby powder by patting it into your face with a brush or pad. You can also use hair spray or makeup sealer. You can find everything you need at your local Halloween store. And voila! with your own magic touch and patience you are now a cool comic book hero! Accentuate your features and complete your Halloween costume with dramatic effect. Piff! Bam! Kaplow! Your Halloween costume is complete! If you are going to be wearing this makeup for over an hour make sure to bring everything you need for touch ups, and a bit of makeup remover with you. Watch out for the possibility of smudging! You can visit Andune’s Facebook page at Iron Skies Cosplay and Model.